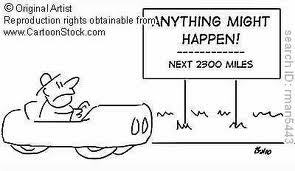 How would you feel if, at the start of a long journey, you encountered a large sign that said, “Next 2900 Miles, Anything Might Happen”? My guess is that you’d get a sick feeling in the pit of your stomach. If you hadn’t yet considered that anything might happen on your journey, you most certainly would once you saw that huge reminder. All sorts of scenarios would start to go through your head and, if you’re anything like me, your imagination would far exceed the possibilities or even the probabilities. The truth is that we’re all on a long journey called life, and the only guarantee we have is that anything might happen – and it probably will. We don’t like to think about it but avoiding the reality won’t make it any less true. On the renovation show, ‘Flip This House’, on one particular episode, the person flipping the house was advised to expect the unexpected… and then expect something else. Great advice… for flipping houses and for navigating life. Life is going to happen – both the expected and the unexpected – and we can fight it, resist it, get panicky over it, stress over it, or decide to run with it. We can’t always choose what happens to us but 100% of the time we have the choice of how we’ll respond to it. How do we handle things the best way possible? Take one day at a time, make plans loosely, and recognize that everything that happens will not always be positive, but it also will not always be negative. Life has its ups and downs. This too shall pass… both the good and the bad. Our perspective at any given moment will have a huge impact on the outcome. So expect the unexpected… and then expect something else. And then fasten your seatbelt and hang on tight because life starts here, and it’s going to be a great adventure! !